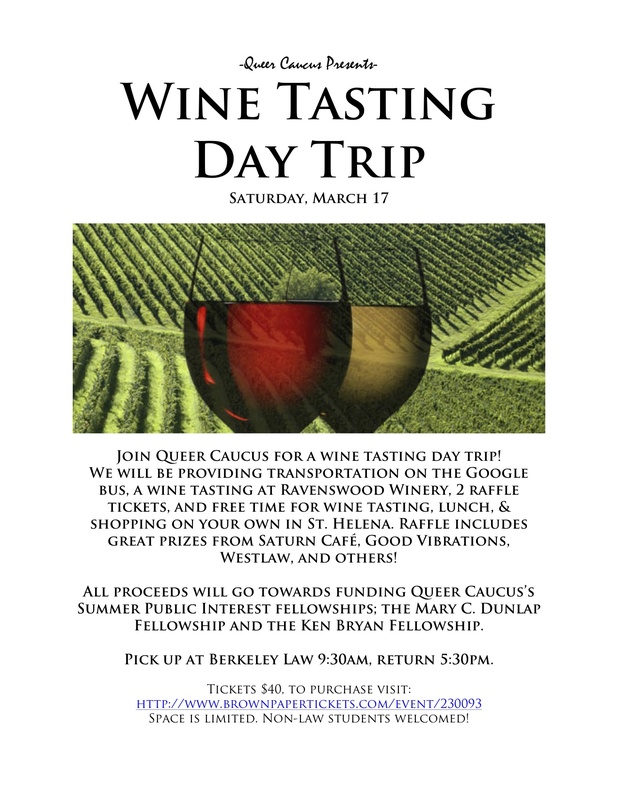 Join Queer Caucus for a wine tasting day trip! We will be providing transportation on the Google bus, a wine tasting at Ravenswood Winery, 2 raffle tickets, and free time for wine tasting, lunch, & shopping on your own in St. Helena. Raffle includes great prizes from Saturn Café, Good Vibrations, Westlaw, and others! All proceeds will go towards funding Queer Caucus’s Summer Public Interest fellowships; the Mary C. Dunlap Fellowship and the Ken Bryan Fellowship. Pick up at Berkeley Law 9:30am, return 5:30pm. Space is limited. Non-law students welcomed!